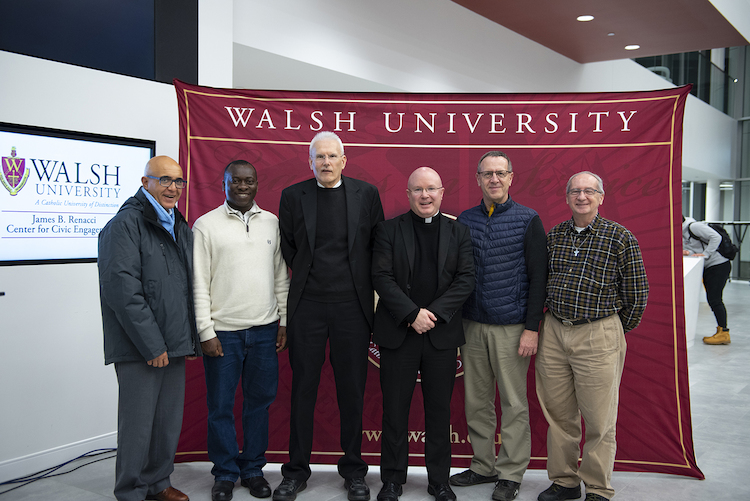 Walsh Lecture Heralds New Student Fellowship with Holy See Mission U.N.
During a special guest presentation on Wednesday, January 23, by Rev. Roger Landry, Representative of the Holy See’s Permanent Observer Mission to the United Nations, Walsh University announced the creation of a new student fellowship opportunity with the Holy See Mission. 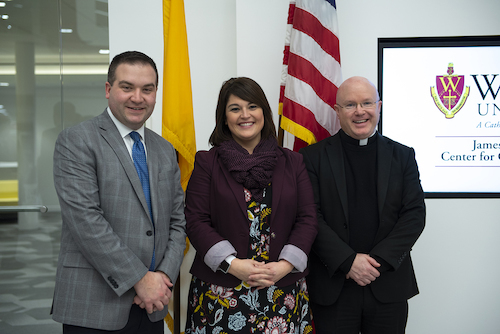 This new academic internship in New York City is the first formal collaboration between Walsh’s Renacci Center for Civic Engagement and the Permanent Observer Mission of the Holy See to the U.N. The Holy See is the universal government of the Catholic Church and operates from Vatican City State, a sovereign, independent territory. The Pope is the ruler of both Vatican City State and the Holy See. The Permanent Observer of the Holy See to the United Nations is the representative of the Holy See at the United Nations. As an introduction to the new fellowship opportunity, Rev. Landry met with students, faculty and staff during his visit and presented a free public lecture Wednesday evening in the Marlene and Joe Toot Global Learning Center on the “Catholic Social Teaching in Action: The Work of the Holy See at the United Nations.” Father Landry is a priest of the Diocese of Fall River, Massachusetts, who works for the Holy See’s Permanent Observer Mission to the United Nations. 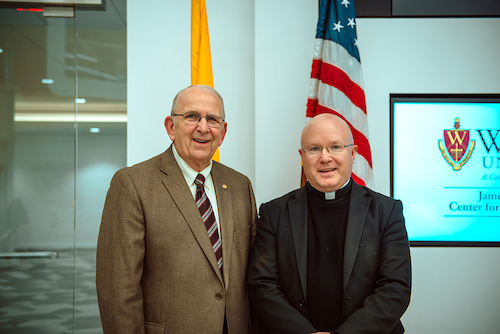 An alumnus of Harvard College and the Pontifical North American College in Rome, Fr. Landry was an on-site commentator for EWTN’s coverage of the 2013 papal conclave that elected Pope Francis. He has appeared often on various Catholic radio programs, is national chaplain for Catholic Voices USA, and is the chaplain for the New York Chapter of the Leonine Forum. The Holy See Mission Fellowship is an internship program that provides the opportunity for bright young Catholic college undergraduate, graduate students or recent graduates to gain invaluable work experience assisting the work of the Holy See in its multilateral work at the U.N., seeking to bring the light of Catholic Social Teaching to the debates of the international community. Fellows receive a special orientation on the history of the diplomatic work of the Holy See at the U.N., attend the wide variety of U.N. meetings, conferences and debates, file reports to be sent to the Holy See’s central offices in the Vatican, in particular to the Secretariat of State, assist in running the Mission’s many conferences, regularly attend receptions and cultural events held by the Holy See and other Missions, and many other activities. The selected Walsh student will receive a stipend to intern in New York City in a full-time position at the Mission of the Holy See to the United Nations during the 4-month period for the spring semester (middle of January through the middle of May) or fall semester (beginning of September through December). 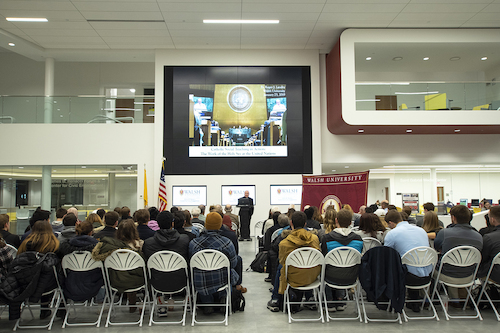 Applications are due April 8 for the 2019 fall semester and September 24 for the 2020 spring semester. Students with questions may contact Renacci Center co-directors Derrick Wyman at dwyman@walsh.edu or Rachel Hosler at rhosler@walsh.edu.